From its pristine beaches to its lush rainforests, the Big Island of Hawaii breathes of romance at every turn. This beautiful, diverse island has something to offer every type of traveler, as there is no shortage of sights to see and activities to partake in during your Big Island vacation. Due to its endless beauty, the Big Island is a popular destination for couples seeking romance, excitement, and adventure. Whether you're newlyweds embarking on your honeymoon or a couple simply seeking a romantic getaway, the Big Island won't disappoint. Couples flock to the Big Island every year to indulge in its stunning natural scenery and its abundance of activities, but you can always enhance the romance of your vacation by staying at one of Vacatia's romantic vacation rentals. If you're looking to book your stay at a top romantic resort in Big Island Hawaii, you should let Vacatia help you find the perfect rental. 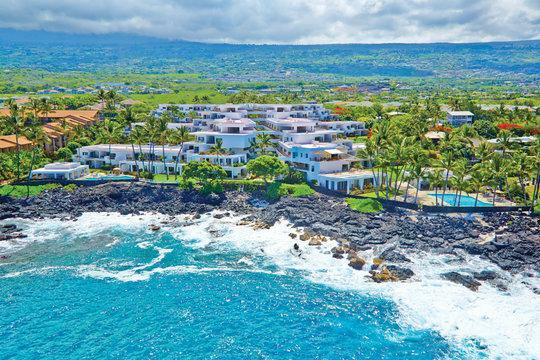 There are plenty of places to stay in Hawaii Big Island for honeymoon romance, and Vacatia can ensure that you book your stay at the most romantic resort possible. Romance is in the air on the Big Island, which is why this Hawaii hotspot is a popular destination for romantic getaways. The Big Island's endless natural beauty and its top-tier resorts have made it a perfect honeymoon spot, and you're sure to make lasting memories during your time on this romance-filled island. When you're planning your romantic getaway to the Big Island, be sure to work with Vacatia to find the perfect vacation rental for you and your significant other. Vacatia can help you sort through all of the best Big Island honeymoon resorts available until you find the perfect Hawaiian home away from home for your romantic vacation. Vacatia's properties aren't like standard hotels, as they provide extra living areas and select comforts of a home in addition to the desired services of a resort. The extra space and comfort of a Vacatia vacation rental will add to the romantic atmosphere of your vacation, so your time on the Big Island is sure to be truly memorable. The Big Island of Hawaii is home to beautiful beaches, active volcanoes, and breathtaking hikes. While there are plenty of stunning beaches that allow for you to laze the days away and soak in some R&R, the Big Island also provides plenty of places to explore. Whether you're looking for relaxation or adventure on your upcoming romantic getaway with your significant other, you're sure to find it on the Big Island. Not only is the Big Island the largest island in the Hawaiian archipelago, but also the island continues to grow every year because of the active Kilauea Volcano. This large, beautiful island is brimming with adventure and romance, so it's the perfect spot for honeymooners looking for a bit of excitement. If you want to further elevate the romance of your Big Island vacation, however, you should work with Vacatia to book your stay at one of the most romantic resorts on the island.